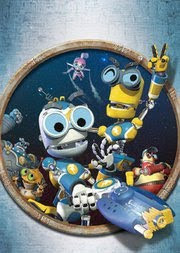 I was approached to do a review of - actually, have the kids review - a new show on Teletoon called 'Bolts and Blip'. It's set in 2080 and robots are tasked with settling human disputes. There are no more wars, just 'robot games'. Although it technically has a violence-type theme, it's more of a game than war. The robots fight with water (because they rust) and really don't get harmed. I'm not a huge fan of the fact that it's centred around getting shot and blown up and squished, but older (6-10) kids might like the fact that it's more 'video gamey' that way. There were a couple jokes in there for adults, too. One older model robot is just standing there instead of helping his team and says, "I've got an old processor. I need an order of operations!" The target age is a bit above Zach, but here are the thoughts that Alexandria (now 6) and Zachary (3) had on the show's first episode. Good. I love it. It has bad guys in it. His name is Bolts. He has bolts in him. I liked the whole one. The whole of the part. I like when it explodes. "What was your favourite part?" The mean guys, because they are mean and shoot people. I didn't even like that part. First of all, I don't like machines and it was machines. And second of all, why did they get squished? And third of all, I didn't really say it was good because I didn't like it. "Were there any parts you did like?" Only when they got squished. I asked her, "What was your favourite part?" I like it when the coach gets so upset he keeps saying the same thing over and over again. It's so funny when he said, "you. you. you. you. you. you......" until he exploded and that's the end of him.